Fungal diseases of the leaf may occur as soon as the first leaves unfold in early spring and continue until dormancy in the late fall. On highly susceptible varieties, these diseases can cause significant economic damage. The primary damage from leaf diseases is a loss of vigor through reduced leaf area. If outbreaks of these leaf diseases become significant, the plants will become weakened resulting in increased susceptibility to root diseases and winter injury. The three major leaf diseases that are caused by fungi have a similar disease cycle and are controlled in a similar manner. Leaf spot, leaf scorch and leaf blight are the most common leaf diseases and they all overwinter in infected dead or living leaves. They all produce spores that spread the disease by causing new infections during moist, warm conditions. Figure 1. 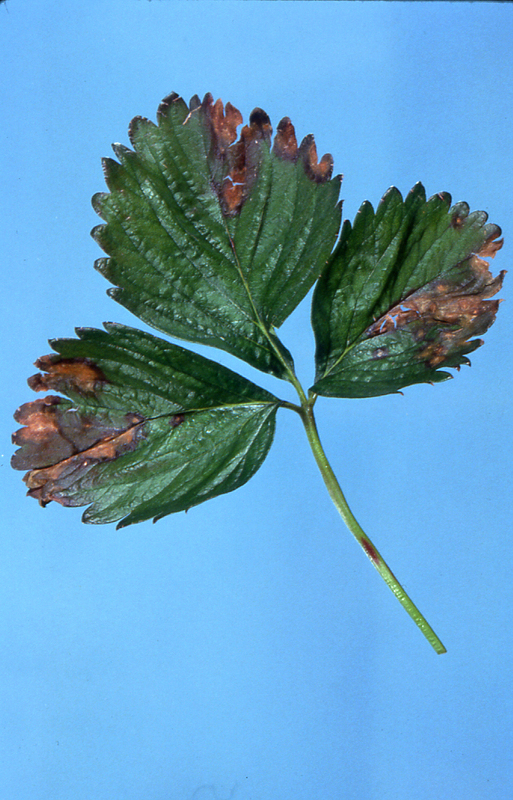 Typical symptoms of leaf scorch, spot, and blight on strawberry leaves. 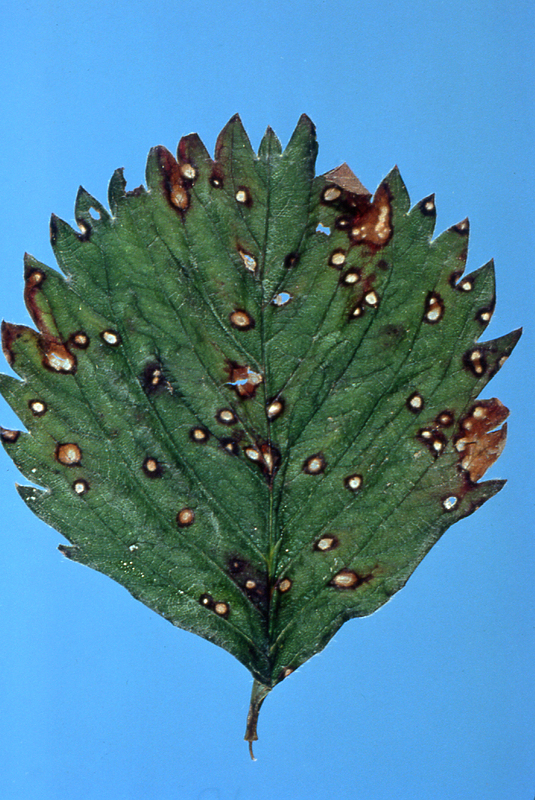 Leaf spot is caused by the fungus, Mycosphaerella fragariae. Symptoms of leaf spot first appear as circular, deep purple spots on the upper leaf surface. These spots enlarge and the centers turn grayish to white on older leaves and light brown on young leaves. A definite reddish purple to rusty brown border surrounds the spots. On fruit, superficial black spots may form under moist weather conditions. The spots form on ripe berries around groups of seeds. The spots are about ¼ inch in diameter, and there are usually only one or two spots per fruit. However, some fruits may be more severely infected. The fungus overwinters as spores in lesions on leaves. The fungus infects the plant and produces more spores in spots on the upper and lower leaf surface that spread the disease during early summer. These spores are spread by splashing rain. Middle-aged leaves are most susceptible. Lesions also develop on stems, petioles and runners. Leaf scorch is caused by the fungus Diplocarpon earliana. Symptoms of leaf scorch consist of numerous small, irregular, purplish spots or “blotches” that develop on the upper surface of leaves. The centers of the blotches become brownish. Blotches may coalesce until they nearly cover the leaflet, which then appears purplish to reddish to brown. The fungus overwinters on infected leaves. The fungus produces spore forming structures in the spring on both surfaces of dead leaves. These structures produce spores abundantly in midsummer. In the presence of free water, these spores can germinate and infect the plant within 24 hours. Older and middle-aged leaves are infected more easily than young ones. Leaf blight is caused by the fungus, Phomopsis obscurans. 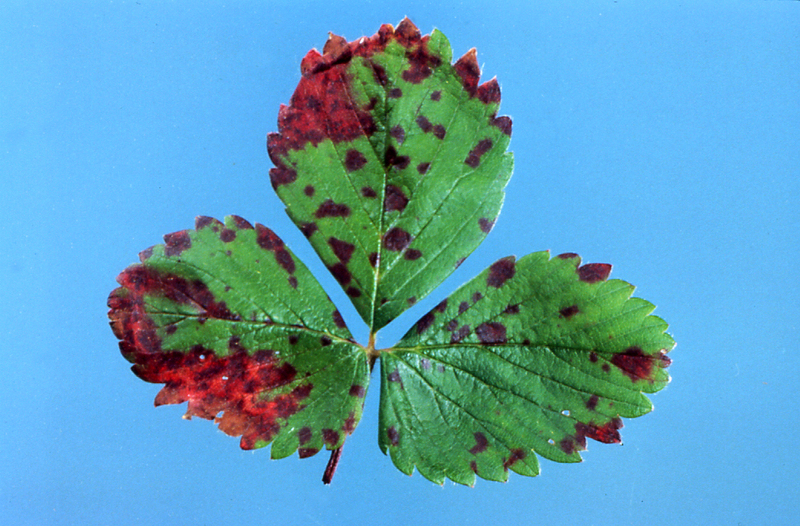 Symptoms of leaf blight infections begin as one to several circular reddish-purple spots on a leaflet. Spots enlarge to V-shaped lesions with a light brown inner zone and dark brown outer zone. Lesions follow major veins progressing inward. The whole leaflet may turn brown. In severe cases, stolons, fruit trusses and petioles may become infected which may girdle and kill the stem. The fungus overwinters as mycelium or fruiting structures on the old leaves that remain attached to the plant. Spores are spread by rain splash early in the spring. Leaf blight is most destructive to older leaves in the late summer. Petioles, calyxes and fruit may also be infected earlier in the season. Figure 2. Strawberry leaf spot. Figure 3. Strawberry leaf scorch. Figure 4. Strawberry leaf blight. Remove the older and infected leaves from runner plants before setting. Take care in spacing runner plants in matted-row culture. Plant in light, well-drained soil in a location exposed to all-day sun and good air circulation. Removing infected leaves after harvest (during renovation) is helpful in reducing inoculum and controlling all the leaf diseases. If leaf diseases are a problem in the planting, fungicides will aid in control. However, the emphasis on control of leaf diseases should be placed on the use of resistant varieties. For the most current fungicide recommendations and spray schedules commercial growers are referred to Bulletin 506, Midwest Fruit Pest Management Guide, and backyard growers are referred to Bulletin 780, Controlling Disease and Insects in Home Fruit Plantings. Backyard growers are encouraged to use resistant varieties. This should eliminate the need for using fungicides to control these diseases. These publications can be obtained from your county Extension office or the CFAES Publications online bookstore at estore.osu-extension.org. This fact sheet was originally published in 2008.